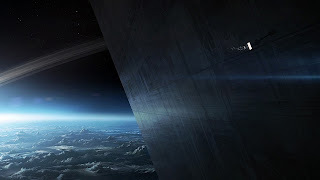 Joseph Kosinski's first film was the Tron sequel, Tron Legacy, and he did a brilliant job at updating the universe of the original, adapting it with modern special effects while boldly keeping its singular and unique imagery. I found it a thrilling and engaging blockbuster, and I could not understand some of its lukewarm reviews. 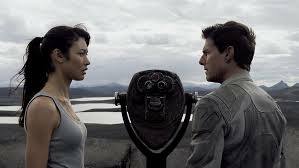 And now the director has gone one step further with Oblivion, which confirms his place as one of the most interesting and promising current directors in the science-fiction genre (not that there is a stiff competition, being a genre that is sorely lacking in ambition nowadays!). In this, he has been blessed with a total control over his new film, from the original story which is based on his own graphic novel, to all the design elements, and it shows. The film dazzles from the start with some awe-inspiring visuals, and a welcome sense of restraint, which puts it at odd with so many annoyingly loud and flashy modern blockbusters. 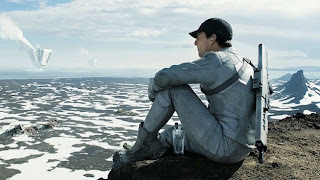 Alternating between scenes set in a glass house up in the clouds, (which looks like it's been designed by both Apple and Wallpaper), and scenes down below on Earth with some beautifully desolated and apocalyptic landscapes (using Iceland's otherwordly and unique beauty just like Prometheus did last year ), this clearly is no standard science-fiction film. Oblivion does offer some carefully calibrated action scenes, including the tense attack of an underground base by drones. But it never feels the need to go over the top with those, and the CGI, as accomplished as it is, is merely here to serve the plot. In the same way, thanks to a perfectly tight script, not a scene or character feel unnecessary. Despite the beautiful techno facade, this is no cold and uninvolving object. Josepsh Kosinski does not forget to include an emotional connection, achieving an unusual sense of intimacy for that kind of film, despite the scale of it all, and he does not neglect his characters either. 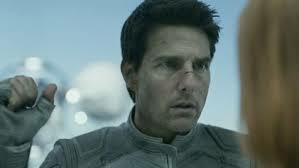 Tom Cruise here delivers his more subtle and slight yet effective performance in years. And both Olga Kurylenko and Andrea Riseborough are offered some intriguing and touching characters to sink their teeth into, which they both grace with their talent (the latter slightly edging it over the former, but then I have such a massive Andrea Riseborough crush right now, so I would say that!). Also watch out for Melissa Leo in a small but memorable and very unusual part! Some have branded Oblivion derivative and a catalogue of sci-fi cliches, which I find grossly unfair and unfounded. Yet it braces themes which might be familiar (and that I will not mention to keep all its surprises intact), but it presents them in a neat and original package, and I did not spend my time being reminded of other films. Besides, as usual, despite all the films I have seen in my life, I did not guess a single twist and had no idea where the story was going. Having said, I did enjoy the many playful nods to sci-fi classics the director has places throughout his film, including a brilliant one to 2001 as well as one to Tron Legacy itself. The film does not revolutionise the genre for sure, this is no Solaris or 2001, yet I did find some of it to be rather thought-provoking. I cannot emphasise enough how beautiful the visuals, and this is a too rare example of a gripping and intelligent blockbuster. I watched it yesterday and the mystery unfolds only at the end. Beautiful visual effects ( I dont know if there is a 3D version to this film). 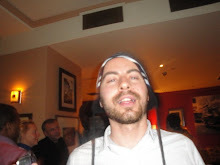 The film is on similar lines to the Maxtrix Revolutions conceptually. Tom Cruise is brilliant, as usual.